Life, love and latte. WHAT’S NEW PUSSYCAT is the freshest, frothiest and funniest romantic comedy for Spring 2000. Why, why, why Delilah? And now that she’s arrived, it seems that Delilah was just what the big city was waiting for. And whether it’s Charlie, the ultimate meejia boy, or sweet Sam, Delilah is desperate not to make the wrong decisions again. Vivienne, the best nbf a girl could have is handing out some very strange advice, yet Delilah must still face a whole new world – on her own – and then really start to live. 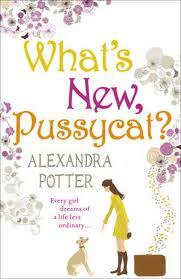 Another fabulous, fresh, fast read from Alexandra potter. I was a little wary of reading this when I found out it was actually this author’s first novel. Having read most of her other, more recent, novels I was cautious in case this didn’t live up to the usual high standard that she had set in my reading expectations, however I was not disappointed! Delilah does what so many of us have dreamed of doing, packs her back and runs off to the big city leaving her small town life and love behind. Now I am biased as I too have run off to London from Yorkshire, and therefore this added a whole other element to the book for me. The reason the reader can identify with the character and her storyline so much is because she literally starts off with nothing. She has nowhere to live, knows no-one, the only connection she has when she heads off to the big smoke is a business card from Charlie who she met in A & E before she ran away. In Alexandra Potter’s usual mix of magic, mysticism and romance, good things start happening for Delilah and it was excellent fun living this out with our heroine! This was a really easy read, a total page tuner and had a satisfying ending with happiness and a twist as well. I think that even if you weren’t a fan of Potter before, you could pick this book up and fall in love with this author, very apt considering the fact that it is her first novel. I can totally recommend this novel, whether you are a Tom Jones Fan or not! I always like the look of the Alexandra Potter books. I do have one on the shelf, I think it was a proof I got throuhg work, it sounded very magical.